Up to 100 members of the party gathered in Dublin this morning to demand change. They want to see more Labour policies implemented in government. 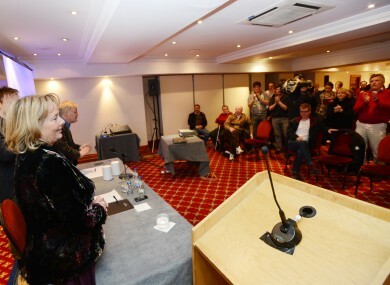 Labour party grass-roots meeting in Gresham Hotel in Dublin. UP TO 100 members of the Labour party gathered in Dublin this morning to call for an immediate change in policy at government level. The meeting heard from Nessa Childers who received “resounding support” and a standing ovation from those attending. The MEP resigned from the parliamentary party yesterday, stating that she could not have “gone on” supporting a coalition that “is actually hurting people”. Paul Dillon, spokesperson for the Campaign for Labour Policies, told TheJournal.ie that the members have called for an immediate conference to discuss renegotiation of the Programme for Government. He said that it was clear from today’s audience that if the leadership of the party doesn’t make such an intention clear, people are ready to “provide a new vehicle for social justice” in Ireland. Dublin TD Patrick Nulty, who has already lost the whip, also attended today’s meeting. There was disappointment expressed at the party’s leadership and its failure to “get across the idea of change”. Eamon Gilmore’s leadership was discussed during the briefing but there was “huge disappointment” expressed at all Cabinet ministers, with Brendan Howlin singled out for “his attacks on public sector wages”. “We’re of the view that there is a change of policy needed rather than a change of leadership,” added Dillon. Speaking on RTÉ Radio One this afternoon, junior minister Seán Sherlock insisted the Labour party was not in crisis. He acknowledged today’s meeting of party members, adding that their demands are not “incongruous” with the party’s plans. He also admitted that Labour was “going through a difficult phase”. He said the decision to delay the party’s conference was made democratically by the whole party because Ireland’s holding of the European Union presidency. Email “Labour party members demand immediate action on policy ”. Feedback on “Labour party members demand immediate action on policy ”.